I came across an article today about how Second Story, a media company from Portland, Oregon has developed the interactive media experience for visitors of a basketry exhibit. Second Story has created two interactive kiosks at The Autry National Center to enhance the exhibit, Art of Native American Basketry helping the viewer gain a deeper understanding of the exhibition along with related artifacts that are part of the museum’s larger collection. The Autry National Center’s Southwest Museum of the American Indian has one of the largest collections of Native American baskets in the world. The Art of Native American Basketry exhibit is ongoing and is scheduled to run until November 7, 2010. Baskets from more than 100 cultures, arranged in eleven geographic regions are featured. Historically important baskets such as a lidded doubleweave rivercane basket attributed to Clara Darden (Chitimacha), a lidded basket with knob handle made by Elizabeth Hickox (Karuk/Wiyot), a willow basket coiled on a three-rod foundation, design in redbud and bracken fern root by Washo basketmaker Dat-So-la-Lee and many more Native American baskets from the early 20th century are featured. The interactive kiosks display a colorful array of these Native American baskets. Individual records contextualize the basket by date, location, culture and usage. 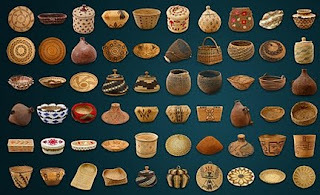 In addition to the rich information about each object, visitors are able to find similar baskets in the larger collection when they filter by Design Motif, Materials Used, Region, Usage, or Technique. Visitors can also enlarge or even rotate the basket images to gain a more complete perspective. Videos and photos show how certain basket materials are gathered and how some baskets are created. These kiosks are a very interesting way to round out the experience of the viewer of an exhibit and are being used to help museums expose more of their permanent collections to their audience. For a bit more about this exhibit take a moment and enjoy a video clip from the Autry. Visit BasketMakers.com for more about basketry exhibits around the United States, Museums that feature baskets in their collections or select a book about Native American Basketry.